Lucy Gluck has been in Vermont since the tender age of five. After various adventures in California, Tunisia, Greece, and Costa Rica, she decided this is one of the most outstanding places on Earth. Her passion for climate action and renewable energy started in college with a “Physics of Energy” course where the student team built and tested a solar thermal system. It worked! Lucy believes that facing the climate crisis demands immediate worldwide action. 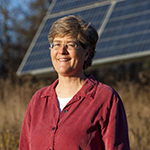 She loves being part of the solar revolution that is a win-win solution for Vermonters and the planet! Lucy is a certified mediator and has a Master’s Degree in cross-cultural training. She served as a health educator in the Peace Corps in Thailand. Most recently, Lucy proudly worked for Vermont Energy Investment Corporation as a trainer, facilitator and Special Projects Manager. Her home is in the Old North End of Burlington with her life partner Martha and a spunky cat named DandyLion. Outside of her Solar Advising work, you can find Lucy riding her green bicycle around town and organizing for social justice.